The very first thing I need to say about this book is that it’s translated from German. The woman who’s story it is lives in Germany and speaks quite a few languages, but she wrote this diary in German. Because of the translation I tried really hard to not be too picky about the grammar and sentence structure. The writing style is not great, but it definitely reads like a diary, and it’s easily understandable. So keep those points in mind while you read my review please! This story is about a 50-something German woman who gets scammed on a dating site. She loses some money (and some self-worth) before she realizes the pleasant Canadian she’s been chatting with is a professional scammer from Ghana. Brigette then decides to report this man (and others who contact her over time) to Romance Scam. This is a website where people report scammers so others won’t be taken in. It was also interesting to read her real-life dating that she was doing concurrently with all the scammer stuff online. She fell very hard for the scammer in Ghana (who she thought was a soldier from Canada) before she had her rude awakening, and so she is having a hard time with “real” men who don’t live up to the story the scammer fed her about the Canadian man. Sadly I can see how people are taken in by these scammers. 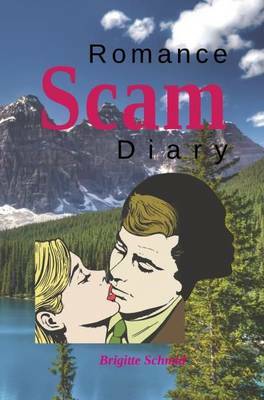 This book, Romance Scam Diary, was interesting to read. I didn’t enjoy the flow of the diary, or that it reads like a translation. I did like reading the real story of someone affected by what I’m sure is a big problem on online dating sites.